Sriracha District, the Internal Security Operations Command and four other groups joined to plant marigolds to bloom in time for HM the late King’s Oct. 26 cremation. Col. Tatsanai Prathumthong, deputy director of the ISOC’s Chonburi branch, joined officials from Surasak, Laem Chabang and Ban Bung, along with volunteers from the Off-Road Thai Jai Rak Pendin Mass Network at the Sept. 10 event at Bung Sub-district’s activity zone. 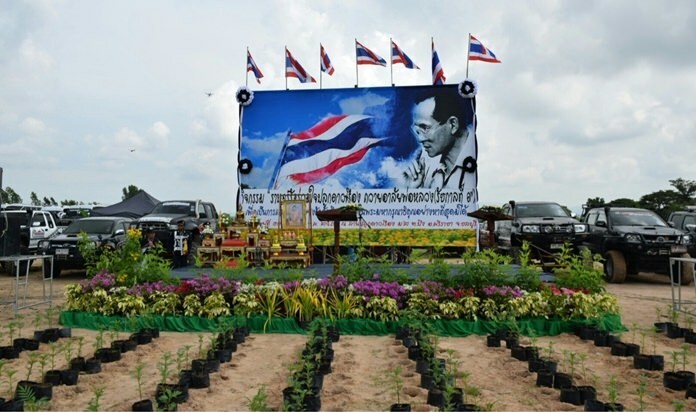 Sriracha District Chief Niti Wiwatwaninich opened the proceedings, which saw 6,000 marigolds planted on 2,800 sq. meters of garden. Tatsanai said the effort will honor the memory of King Rama IX and serve to attract tourists in the future. Previous articleBooze sales banned on beach starting in Oct.